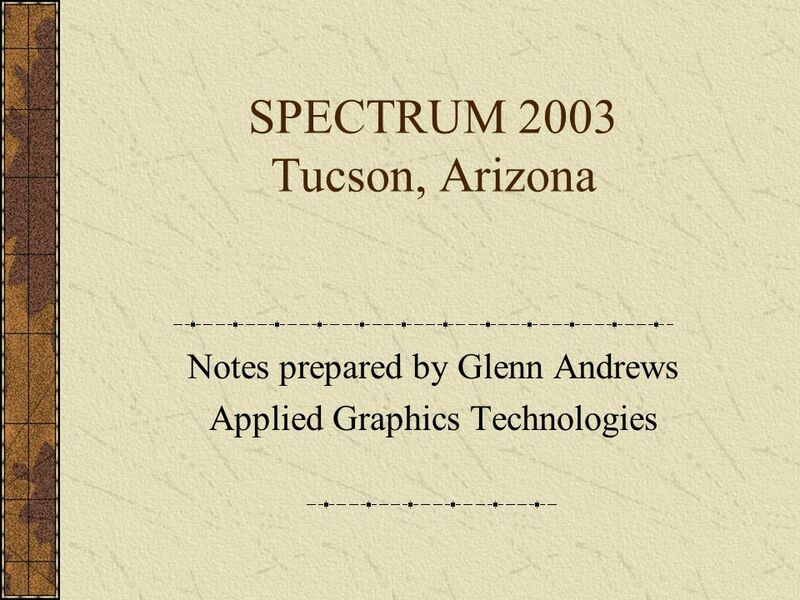 SPECTRUM 2003 Tucson, Arizona Notes prepared by Glenn Andrews Applied Graphics Technologies. 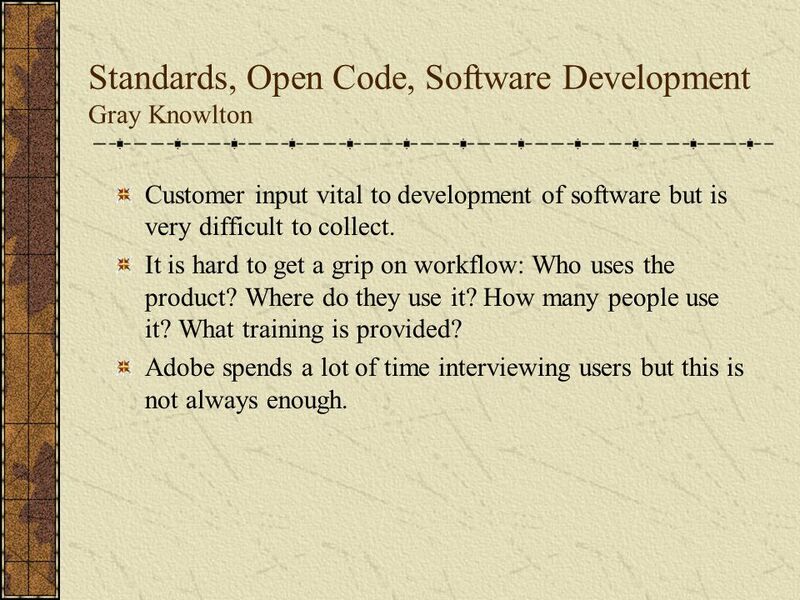 6 Standards, Open Code, Software Development Gray Knowlton Customer input vital to development of software but is very difficult to collect. 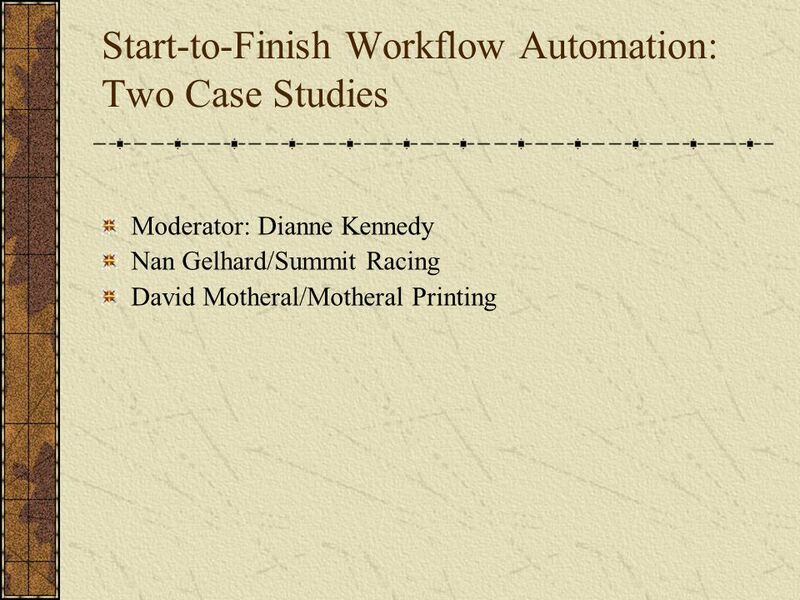 It is hard to get a grip on workflow: Who uses the product? Where do they use it? How many people use it? What training is provided? Adobe spends a lot of time interviewing users but this is not always enough. 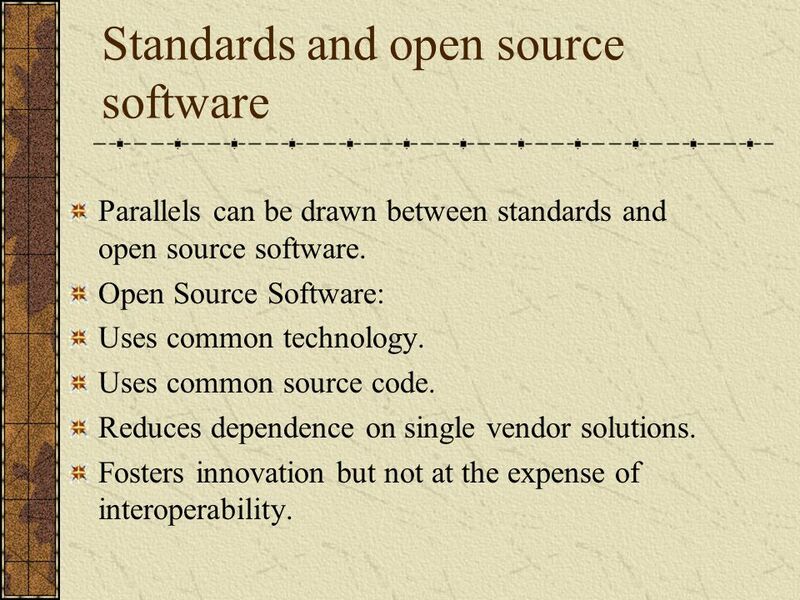 8 Standards and open source software Parallels can be drawn between standards and open source software. 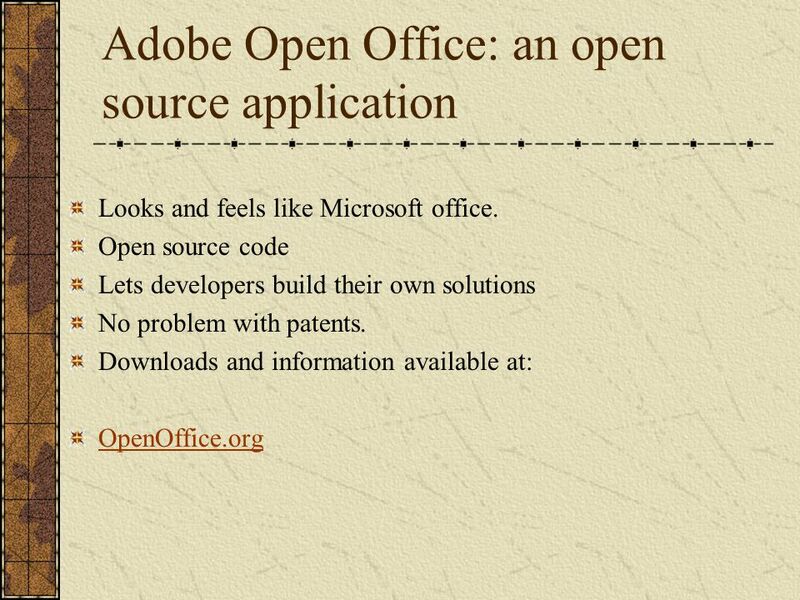 Open Source Software: Uses common technology. Uses common source code. Reduces dependence on single vendor solutions. Fosters innovation but not at the expense of interoperability. 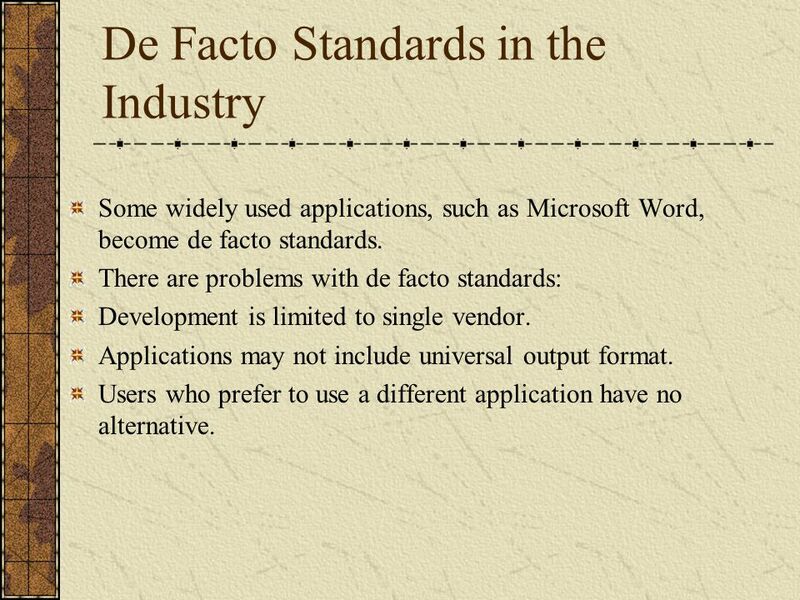 9 De Facto Standards in the Industry Some widely used applications, such as Microsoft Word, become de facto standards. 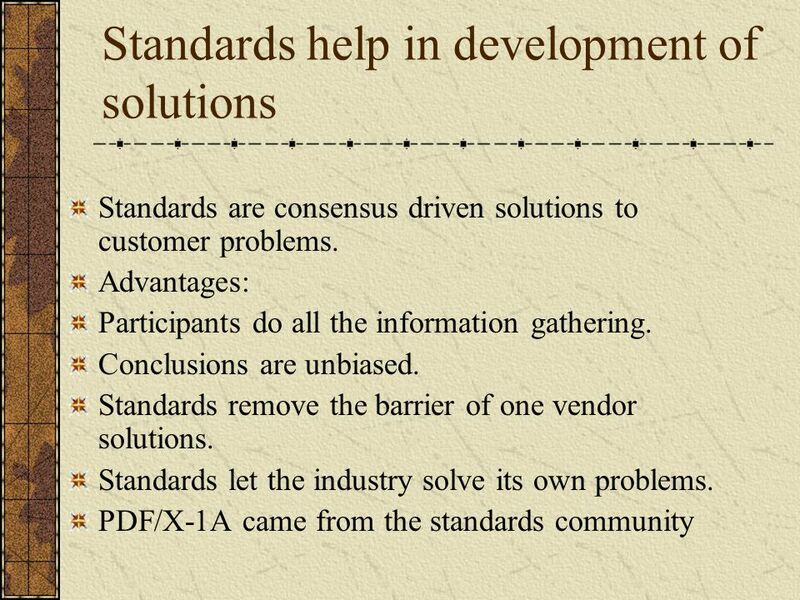 There are problems with de facto standards: Development is limited to single vendor. Applications may not include universal output format. Users who prefer to use a different application have no alternative. 11 Why do standards lag behind practices? 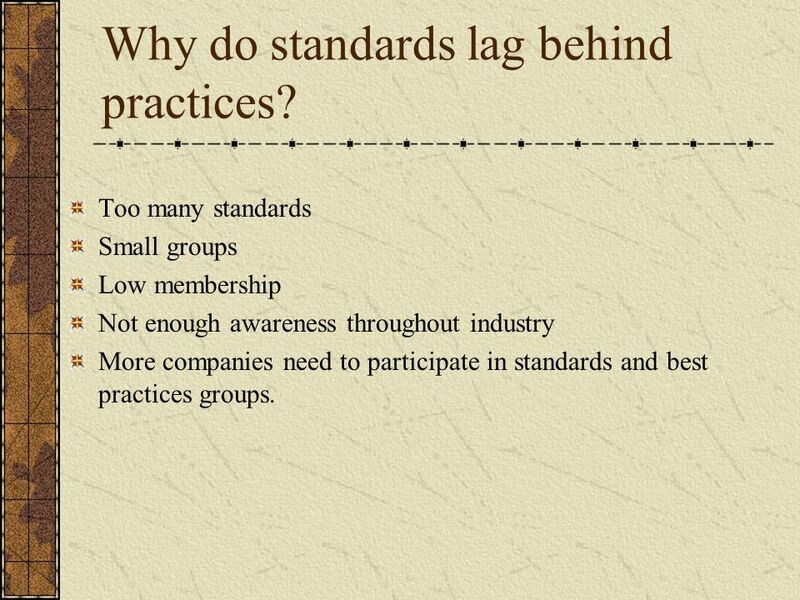 Too many standards Small groups Low membership Not enough awareness throughout industry More companies need to participate in standards and best practices groups. 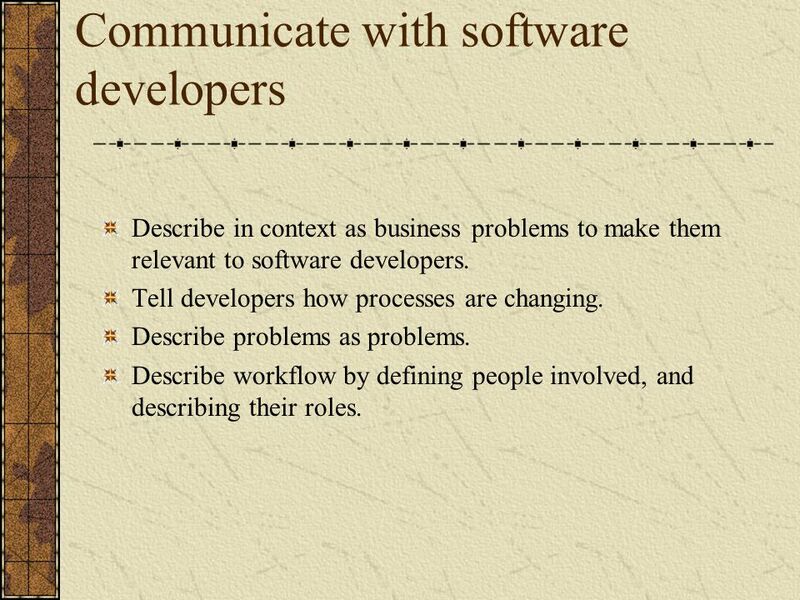 12 Communicate with software developers Describe in context as business problems to make them relevant to software developers. 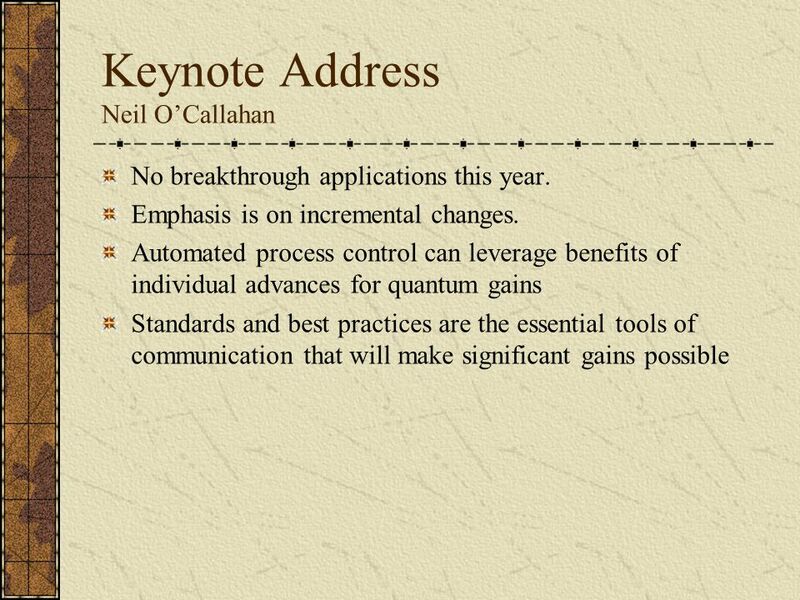 Tell developers how processes are changing. Describe problems as problems. Describe workflow by defining people involved, and describing their roles. 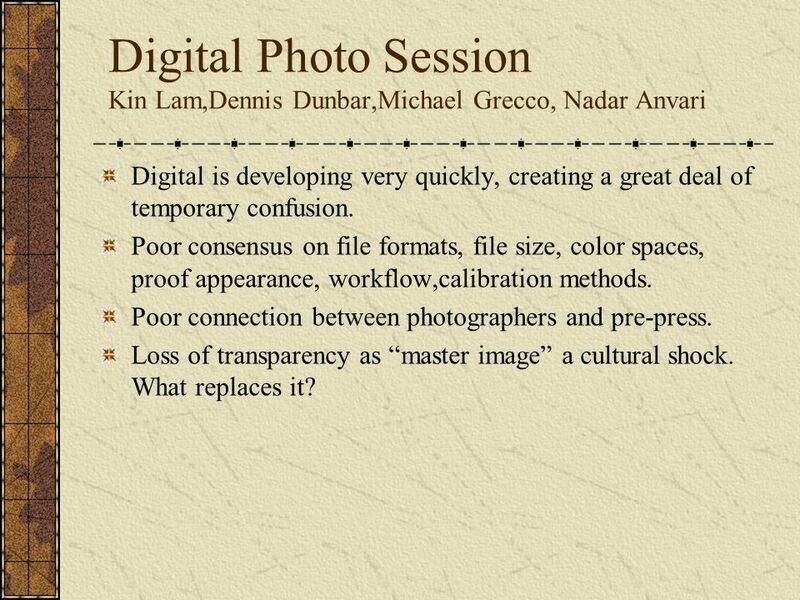 13 Digital Photo Session Kin Lam,Dennis Dunbar,Michael Grecco, Nadar Anvari Digital is developing very quickly, creating a great deal of temporary confusion. 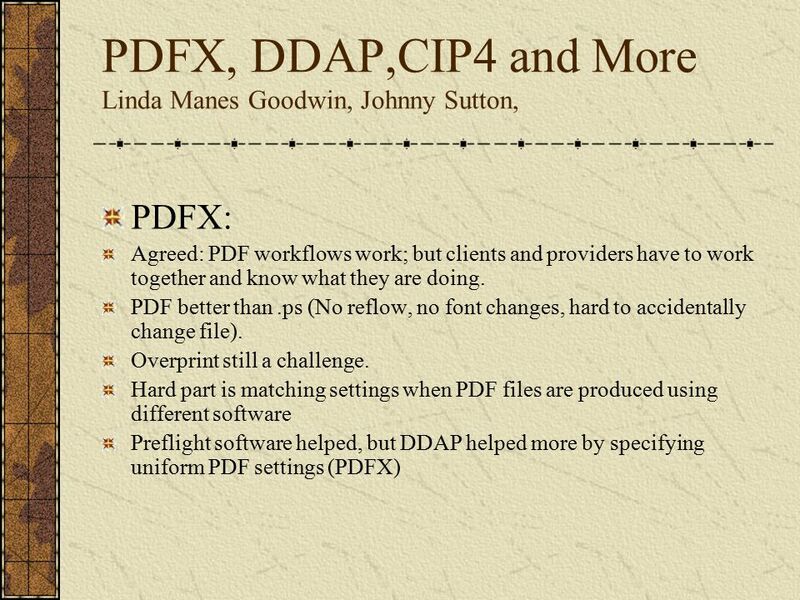 Poor consensus on file formats, file size, color spaces, proof appearance, workflow,calibration methods. Poor connection between photographers and pre-press. Loss of transparency as “master image” a cultural shock. What replaces it? 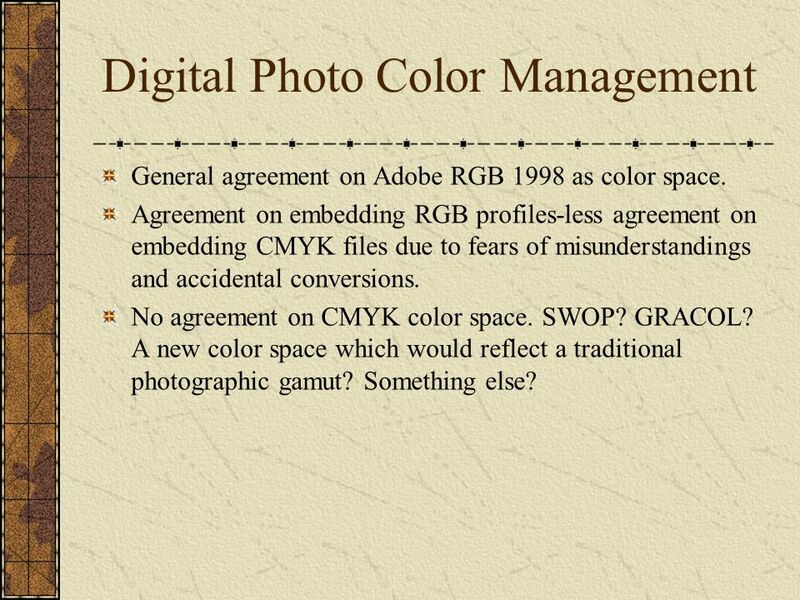 14 Digital Photo Color Management General agreement on Adobe RGB 1998 as color space. Agreement on embedding RGB profiles-less agreement on embedding CMYK files due to fears of misunderstandings and accidental conversions. No agreement on CMYK color space. SWOP? GRACOL? A new color space which would reflect a traditional photographic gamut? Something else? 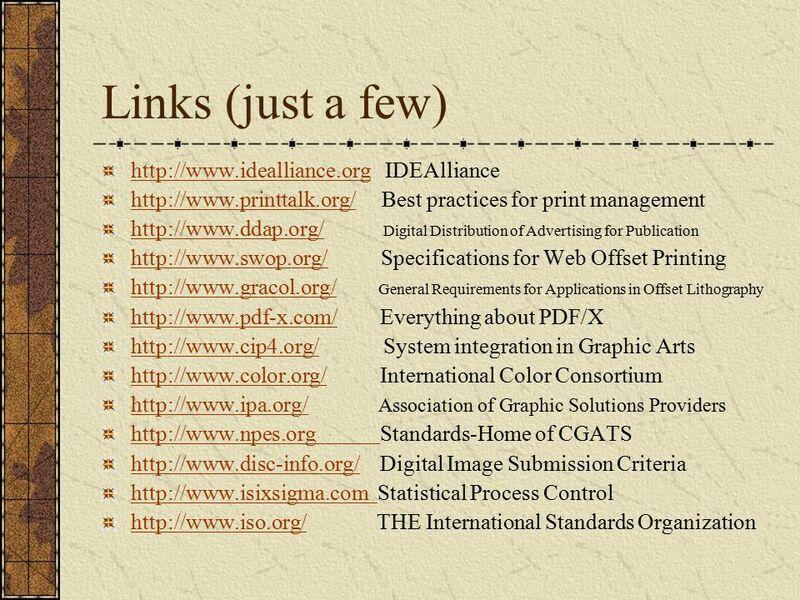 15 Digital Image Submission Criteria D.I.S.C. is a working group of IDEAlliance focused on quality specifications for printable image submission and development of best practices. 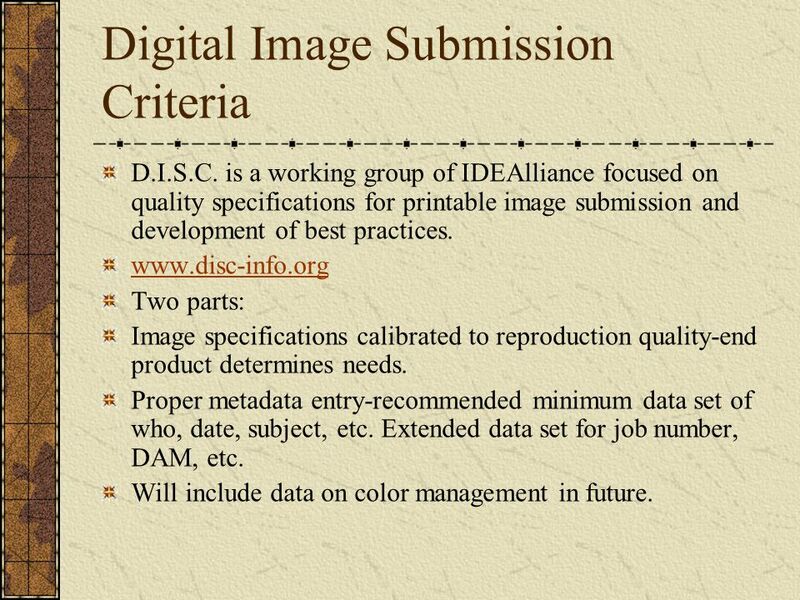 www.disc-info.org Two parts: Image specifications calibrated to reproduction quality-end product determines needs. Proper metadata entry-recommended minimum data set of who, date, subject, etc. Extended data set for job number, DAM, etc. Will include data on color management in future. 16 Originals and Proofs With “master” trans gone, the “look” of an image is less defined. What replaces it? Monitor? Photo Print? Other Proof? What CMYK space? Photographers currently experience vastly different “looks” on different monitors, proofers, and printers. 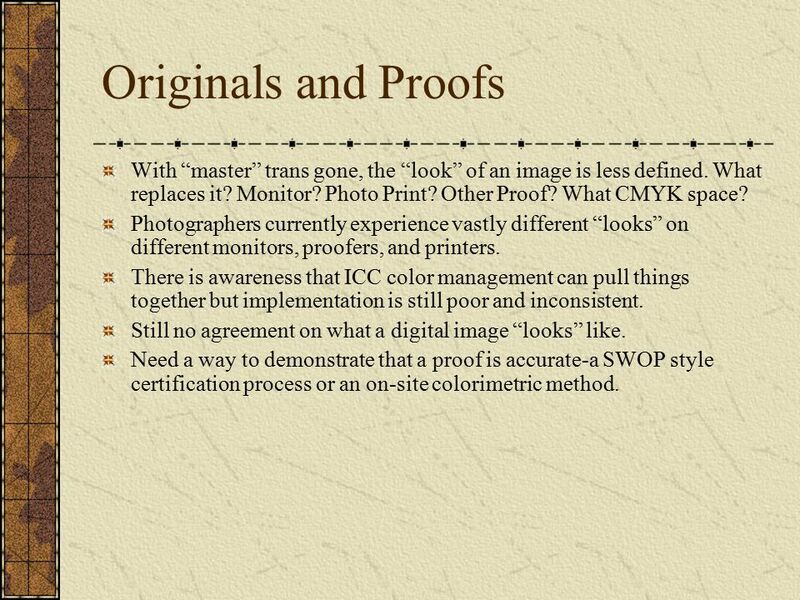 There is awareness that ICC color management can pull things together but implementation is still poor and inconsistent. Still no agreement on what a digital image “looks” like. Need a way to demonstrate that a proof is accurate-a SWOP style certification process or an on-site colorimetric method. 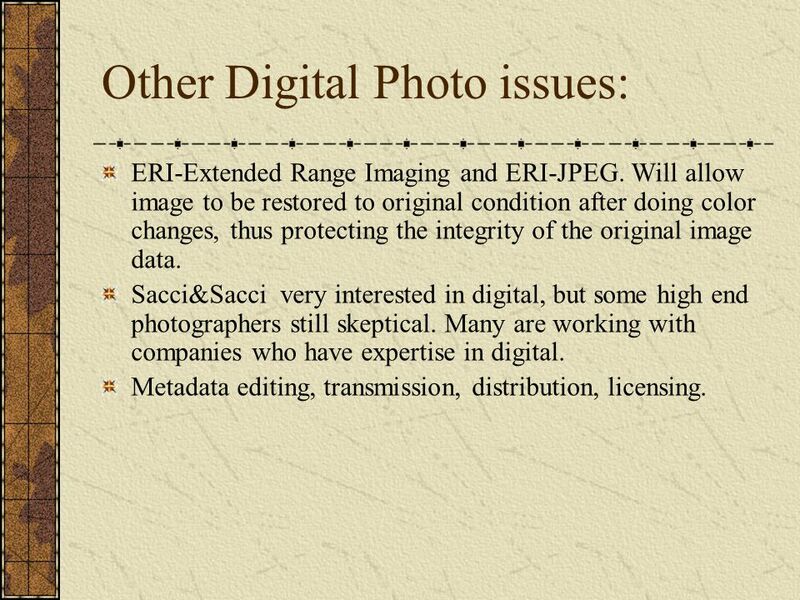 17 Other Digital Photo issues: ERI-Extended Range Imaging and ERI-JPEG. Will allow image to be restored to original condition after doing color changes, thus protecting the integrity of the original image data. Sacci&Sacci very interested in digital, but some high end photographers still skeptical. Many are working with companies who have expertise in digital. Metadata editing, transmission, distribution, licensing. 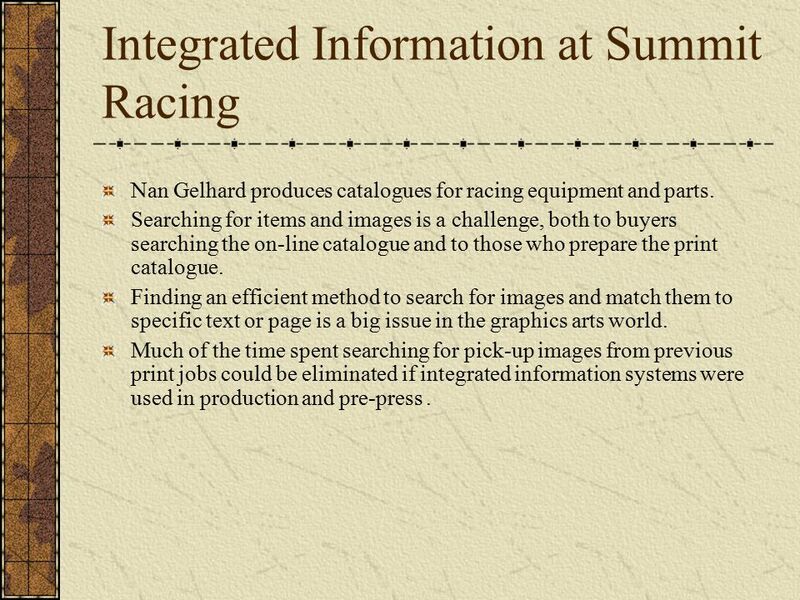 19 Integrated Information at Summit Racing Nan Gelhard produces catalogues for racing equipment and parts. Searching for items and images is a challenge, both to buyers searching the on-line catalogue and to those who prepare the print catalogue. Finding an efficient method to search for images and match them to specific text or page is a big issue in the graphics arts world. Much of the time spent searching for pick-up images from previous print jobs could be eliminated if integrated information systems were used in production and pre-press. 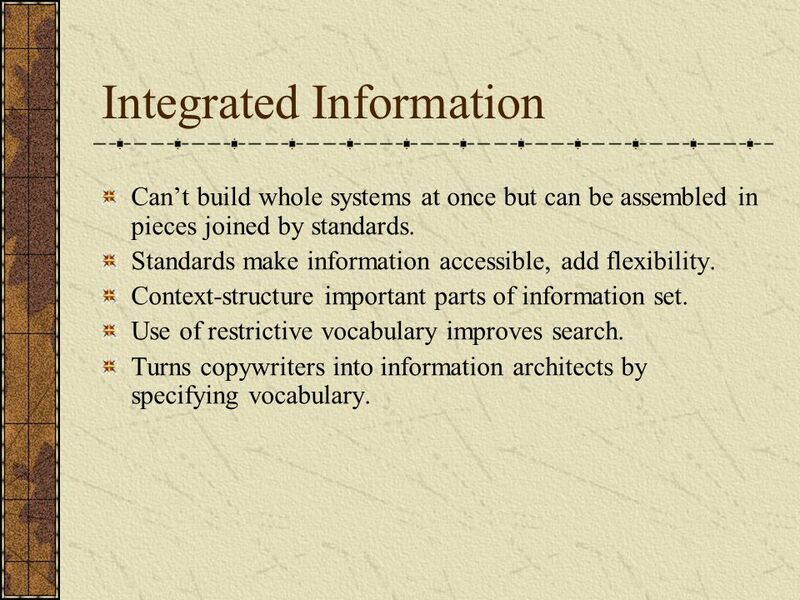 20 Integrated Information Can’t build whole systems at once but can be assembled in pieces joined by standards. Standards make information accessible, add flexibility. Context-structure important parts of information set. Use of restrictive vocabulary improves search. Turns copywriters into information architects by specifying vocabulary. 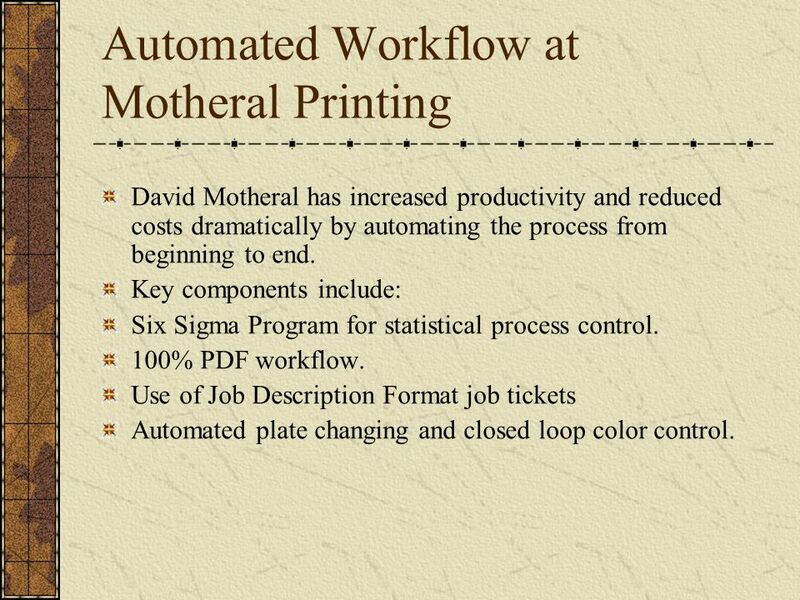 21 Automated Workflow at Motheral Printing David Motheral has increased productivity and reduced costs dramatically by automating the process from beginning to end. Key components include: Six Sigma Program for statistical process control. 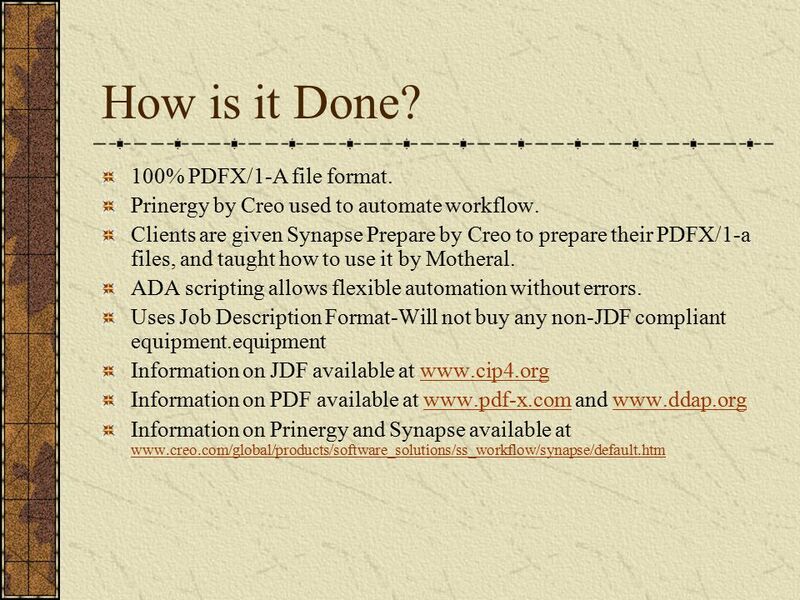 100% PDF workflow. 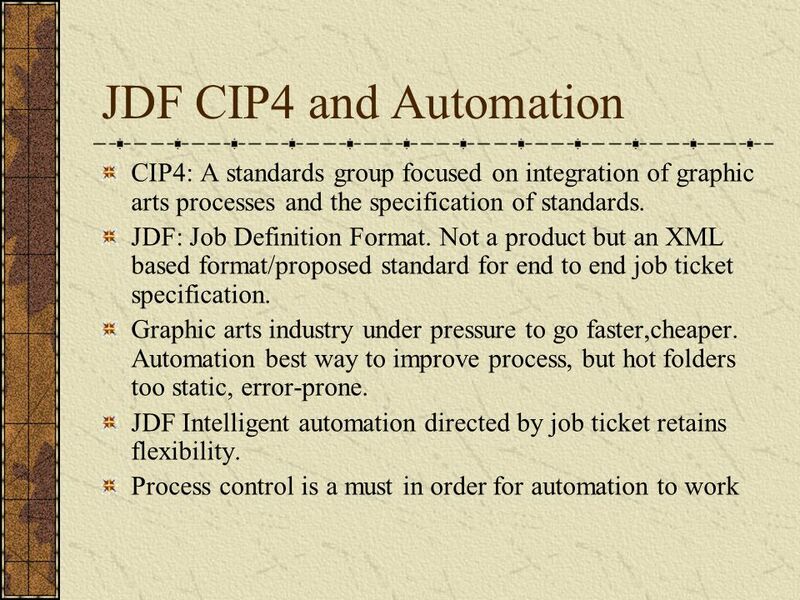 Use of Job Description Format job tickets Automated plate changing and closed loop color control. 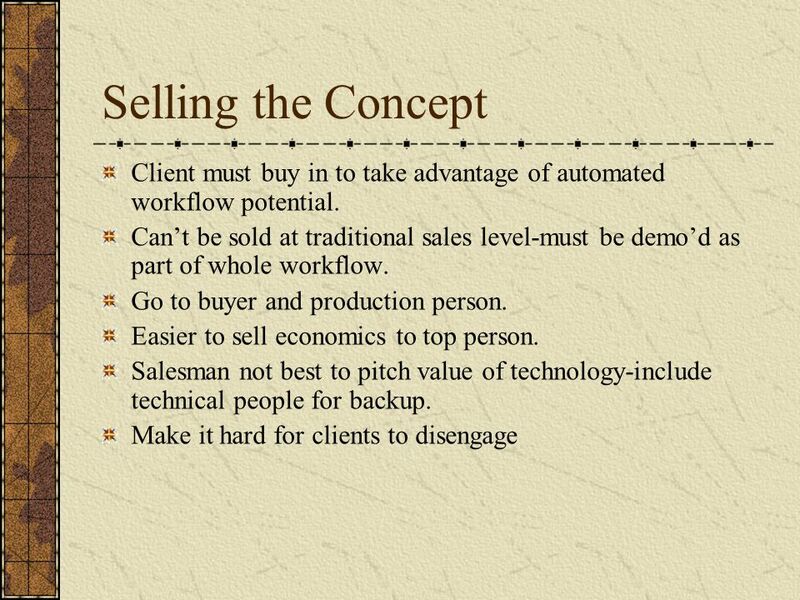 22 Benefits of Automation Prep department has gone from 30 to 2 employees as volume increases by 100%. No preflighting. Rip, Trap and Output at 1.27 seconds per page. Prep is bigger profit center than press. Spoilage has dropped from 8% to 0.27% Time to change plates and start new press run has dropped from 1.5 hours to 6 minutes. Prep costs so low they are no longer tracked. 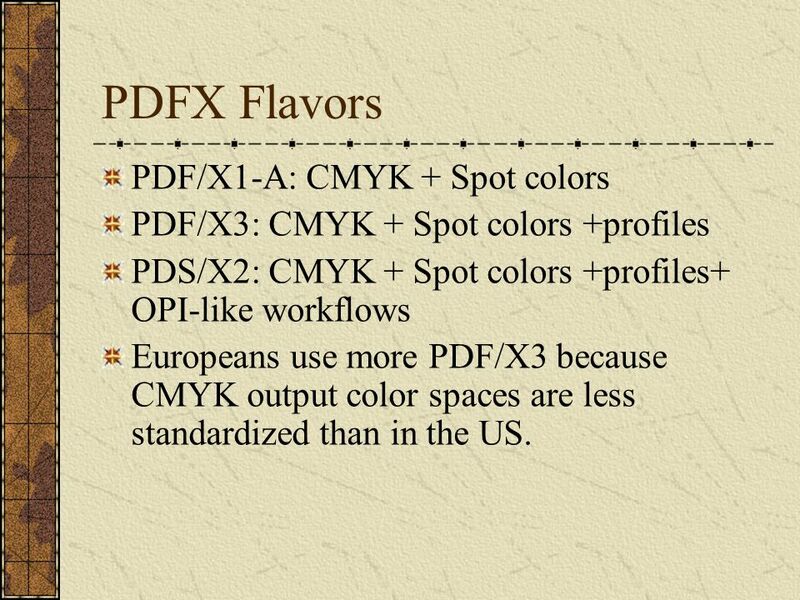 26 PDFX Flavors PDF/X1-A: CMYK + Spot colors PDF/X3: CMYK + Spot colors +profiles PDS/X2: CMYK + Spot colors +profiles+ OPI-like workflows Europeans use more PDF/X3 because CMYK output color spaces are less standardized than in the US. 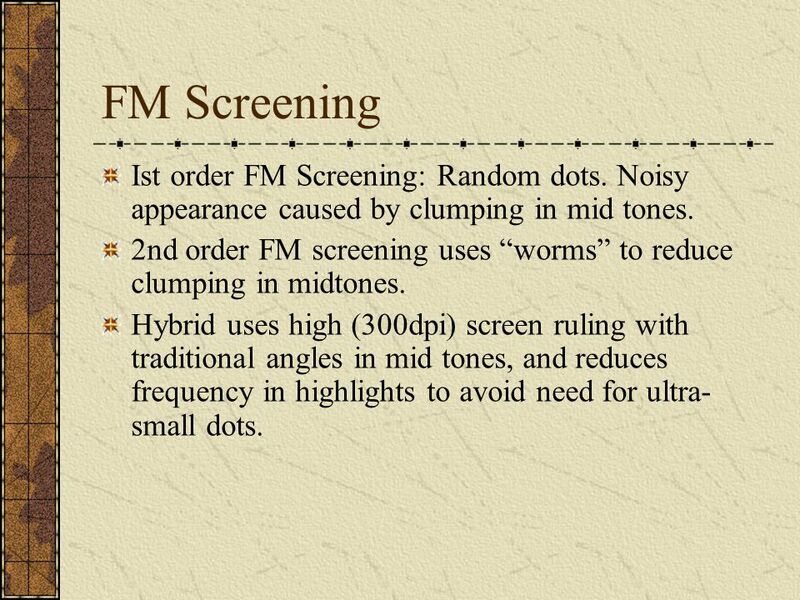 32 FM Screening Ist order FM Screening: Random dots. Noisy appearance caused by clumping in mid tones. 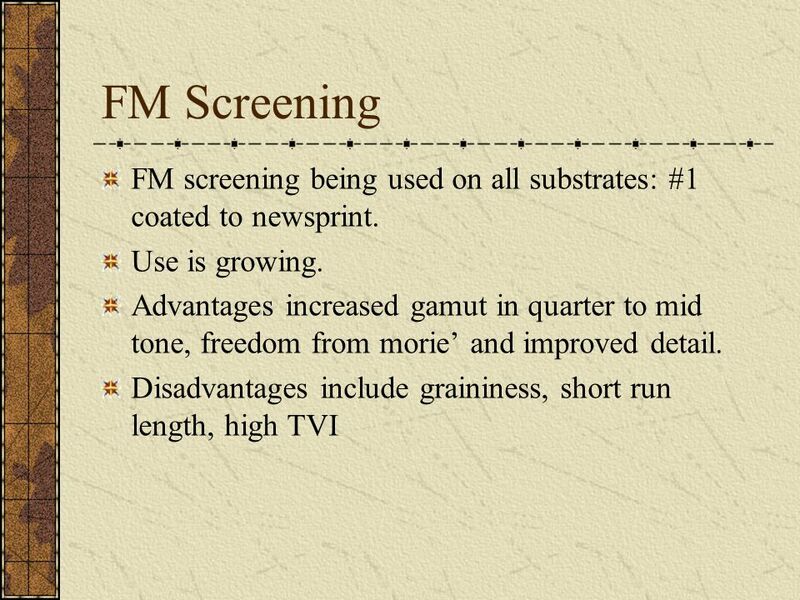 2nd order FM screening uses “worms” to reduce clumping in midtones. Hybrid uses high (300dpi) screen ruling with traditional angles in mid tones, and reduces frequency in highlights to avoid need for ultra- small dots. 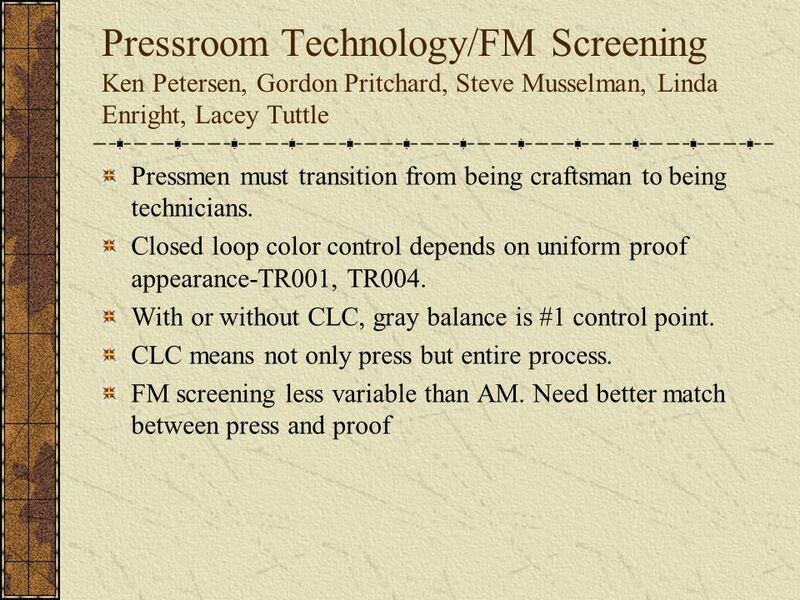 33 FM Screening: Pressroom Considerations FM is like running 300 dpi: you need very high levels of pressroom control to do it. #1 cause of problems in FM in inconsistency throughout the run. Ink piling can be a concern, especially on heatset presses, or with high tack inks.This tends to happen at 20 micron dot size. 25 micron dot size less prone to piling, is the smallest practical size. Creo has a service available to tune-in presses for stochastic printing. 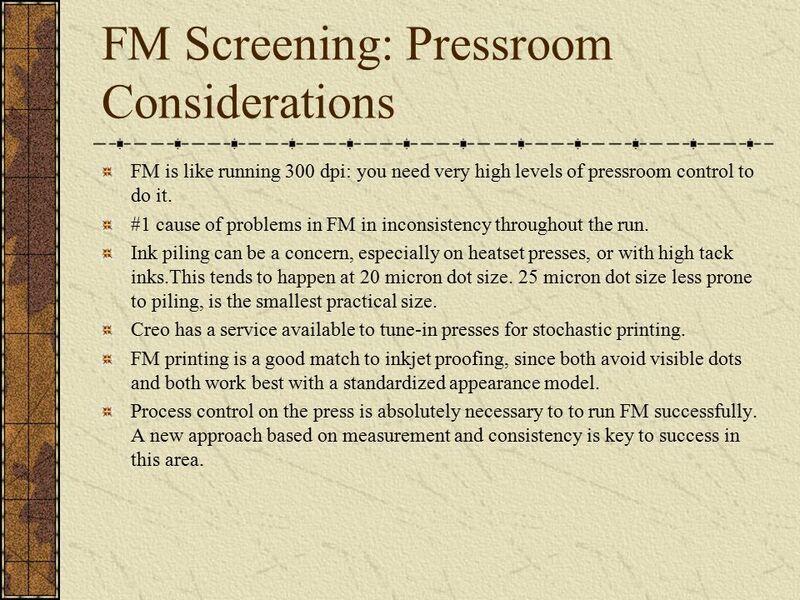 FM printing is a good match to inkjet proofing, since both avoid visible dots and both work best with a standardized appearance model. Process control on the press is absolutely necessary to to run FM successfully. A new approach based on measurement and consistency is key to success in this area. 34 Monitor/Soft/Remote Proofing Dan Caldwell, Brad Mintz, Jim Smiddy, Cheryl Peters Lacey Tuttle Terms are being used inexactly. Remote proofing refers to any proofing device being used at a remote location. Soft proofing means using a monitor to OK content only proofs. Monitor proofing means simulating the look of a printed sheet on a color monitor. 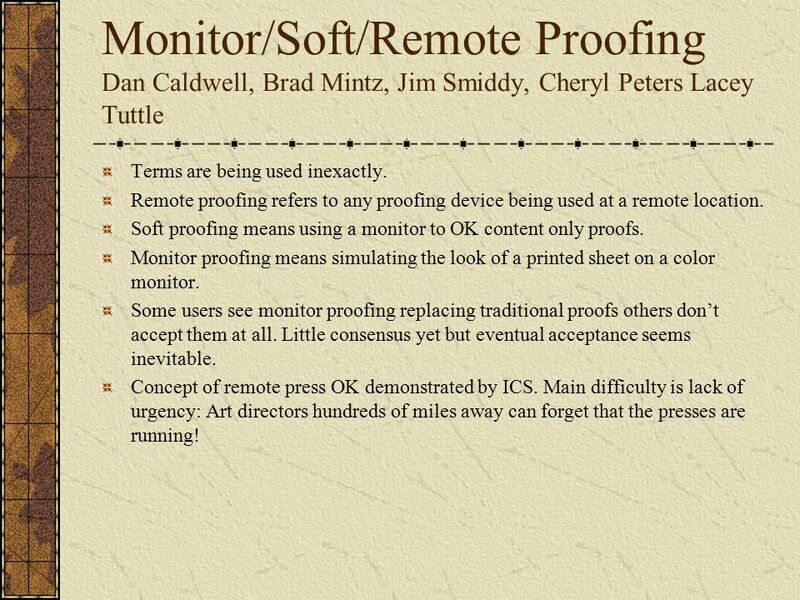 Some users see monitor proofing replacing traditional proofs others don’t accept them at all. Little consensus yet but eventual acceptance seems inevitable. Concept of remote press OK demonstrated by ICS. Main difficulty is lack of urgency: Art directors hundreds of miles away can forget that the presses are running! 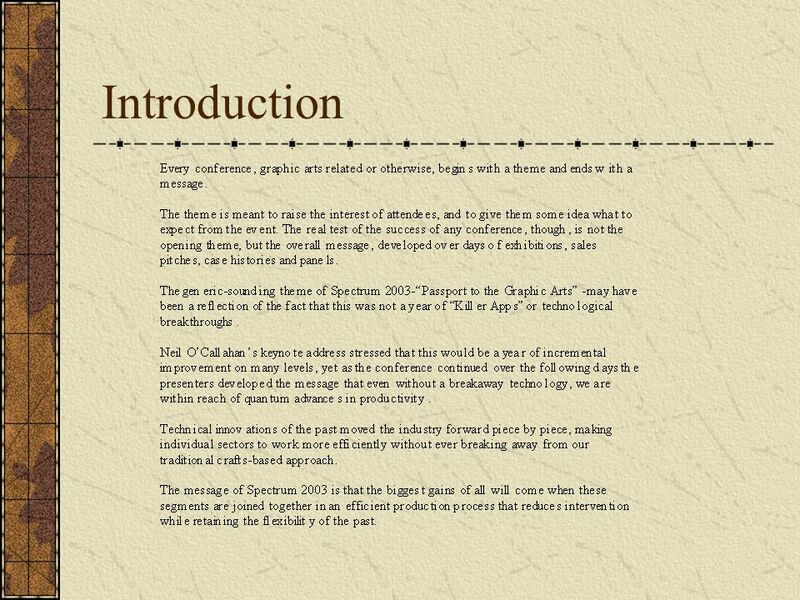 Download ppt "SPECTRUM 2003 Tucson, Arizona Notes prepared by Glenn Andrews Applied Graphics Technologies." HelpDesk OSP Presentation HelpDesk OSP converts s into SharePoint list items HelpDesk OSP creates SharePoint list items from Outlook HelpDesk OSP. 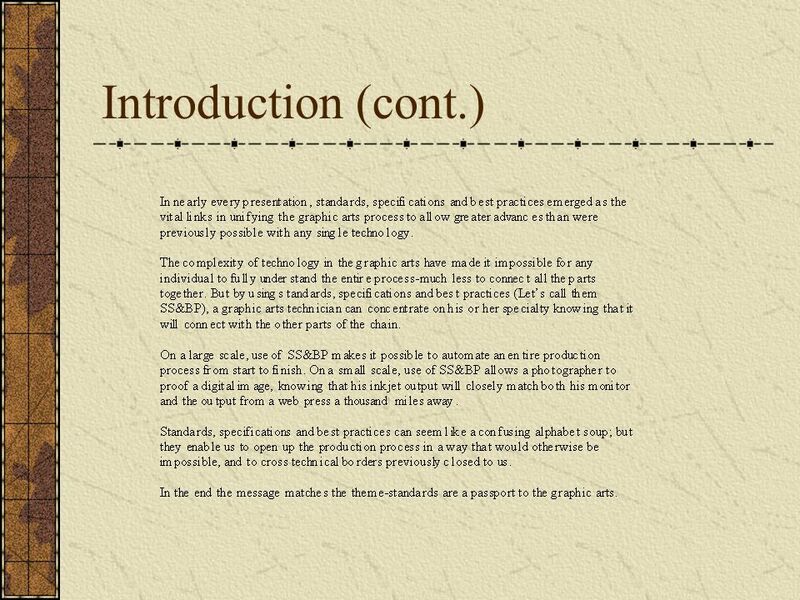 Standards and Increasing Maintainability on Web- based Systems James Eaton SE4112/16/2006. 1 Trueflownet JDF integration Rebecca Aquino Sr. Product Manager, Strategic Planning. Dreamweaver Domain 3 KellerAdobe CS5 ACA Certification Prep Dreamweaver Domain 2 KellerAdobe CS5 ACA Certification Prep Dreamweaver Domain 2: Planning. A Digital Imaging Primer Nick Dvoracek Instructional Resources Center University of Wisconsin Oshkosh. Workshop Design Development Budaörs. Technical Concepts. 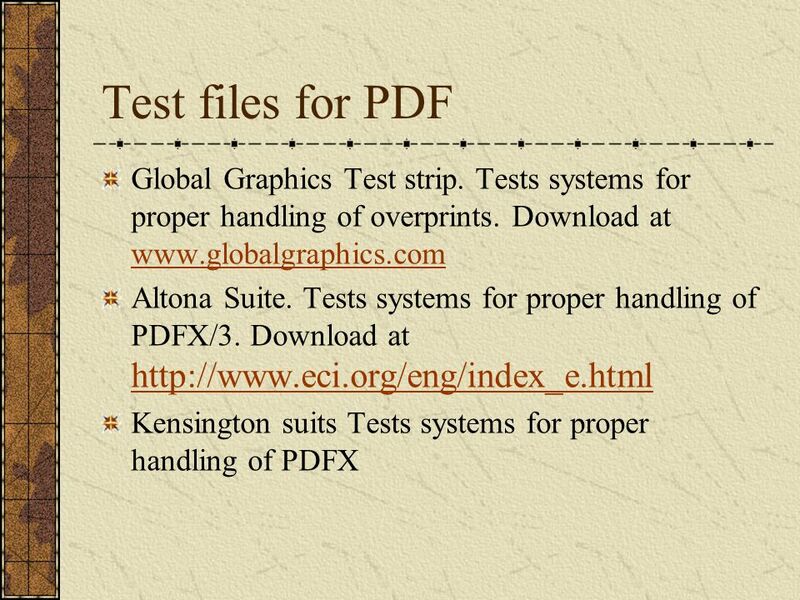 Portable Document Format PDF. What is PDF? 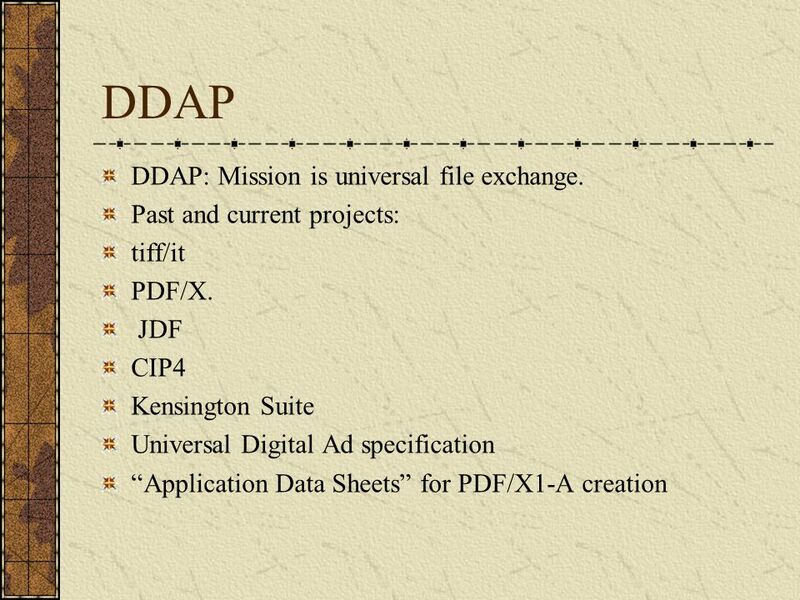 Universal file format developed by Adobe Systems Incorporates fine detail and quality of print publications. What to do when you are done. PRINTING WITH PHOTOSHOP. A quick introduction to shooting digital images in RAW.